You are here: Home / Shorting / Hurting Stocks to Short? Today’s stocks look poised to fall further from their recent 52-week highs. 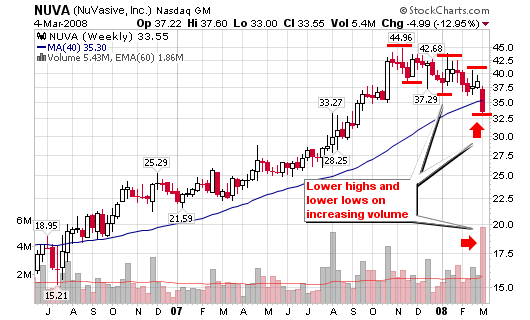 All five stocks were down on above average volume Tuesday as they trade below their long term 200-day moving average. 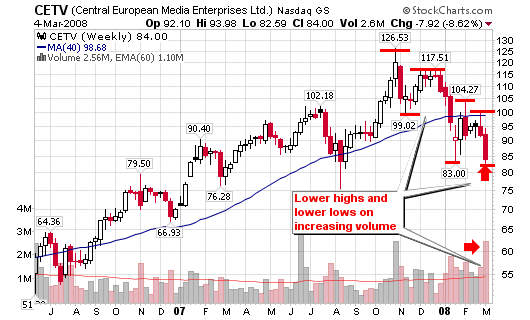 Volume is increasing on both the daily and weekly charts as they continue to log lower highs and lower lows. Add to the fact that they are all several months removed from their 52-week highs and we have PRIME candidates for shorting or put options (whatever your forte). I detailed the characteristics of longer term shorts in the two blog posts below. The rules in these posts are the exact ones I follow for longer term shorting (I lean towards put options). Remember, I am not day trading for quick profits; I am looking for trends that will last from weeks to months. *Disclaimer: These stocks are not trade recommendations; they are purely provided as equity research. Please do your own due diligence and consult a financial advisor before trading (especially shorting). CETV – 84.00, the stock was down 9.44% today on volume 764% larger than the average. We will go on to have the largest weekly volume in years by the time the market closes Friday. 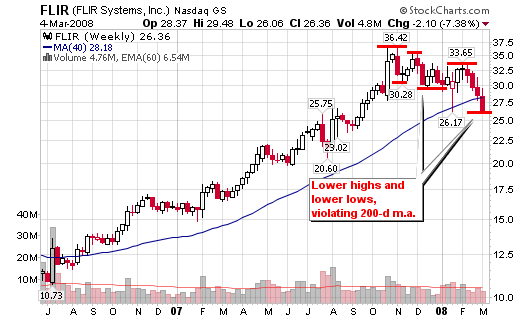 Lower highs and lower lows with the stock breaking below the 200-d m.a. shows tremendous weakness. A drop to the $66 area and then $55 is not out of the question. NUVA – 33.55, the stock was down 4.39% on volume 595% larger than the average. The 13% drop this week has taken the stock below the 200-d m.a. on the largest volume in years. Heavy institutional distribution. FLIR – 26.36, the stock was down 9.35% on volume 137% larger than the average. Today’s move took the stock below the 200-d m.a. on heavy volume, the largest in months. IBN – 46.91, the stock was down 6.70% today on volume 113% larger than the average. 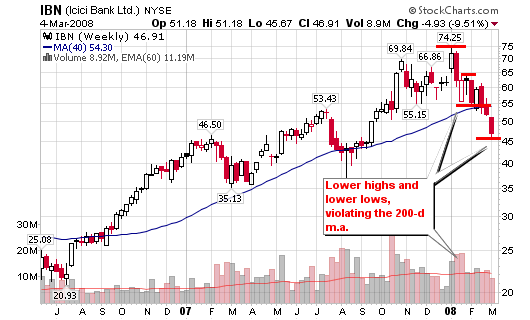 Four consecutive down days has led the stock below the 200-d m.a. on increasing volume. Lower highs and lower lows has been the recent trend. YZC – 77.40, the stock was down 7.37% on volume 99% larger than the average. Lower highs and lower lows is the trend as the stock could be headed towards the $64 area and then $50 if the trend continues. DECK, MGM and CMG also look like those you show us. I do not know if insider sales are something you consider important for short candidates. I believe it is a fairly important signal. According to Barrons FLIR had insider selling 02/25/08 and 11/26/07. How about BBY, CAH and APOL? 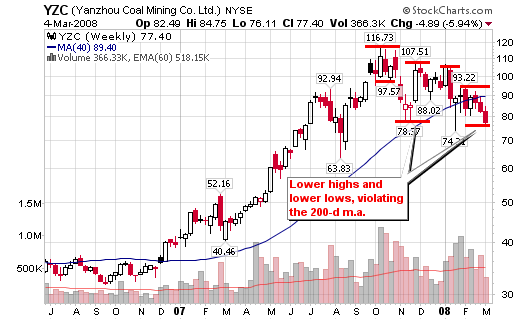 Of the three you mention, APOL catches my attention the most as I like that chart the best for a risk/reward breakdown.